If you want to reduce the election to just two constituencies, here are today’s candidates: Keighley & Sherwood. Based on Ladbrokes’ odds on every seat in the country, we can calculate the tipping point contests which could decide the election. If the Tories are to remain as the largest party, our latest odds suggest they will have to win 281 seats. Their 281st most likely win, as implied by those odds, is Keighley. Labour narrow favourites to win, which is strange in some ways because the Tories are currently marginal favourites to win most seats. 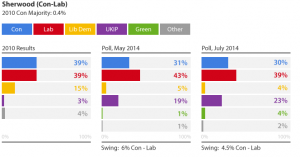 Lord Ashcroft polled the seat back in October and found Labour ahead by 6%. I might expect it to be a little closer if it were polled today, given that the national surveys have moved slightly towards the Conservatives since. One of the crucial factors here is how that 23% UKIP vote holds up. If the Tories can win a few of those back, and perhaps if the #GreenSurge causes a few Labour voters to switch, this could be on a knife edge. An unexpected tipping point seat, given that the Tories hold it already and don’t have a majority. The betting implies that they have 325 more likely seat wins, though. 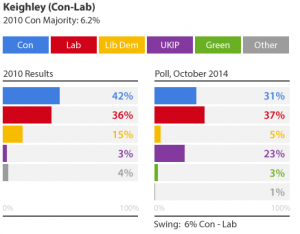 A tiny 214 vote majority for the Conservatives and Ashcroft has already polled it twice. Similarly to Keighley, there is a very high UKIP vote here and I would assume that incumbent MP Mark Spencer will be targeting that in a bid to achieve re-election. 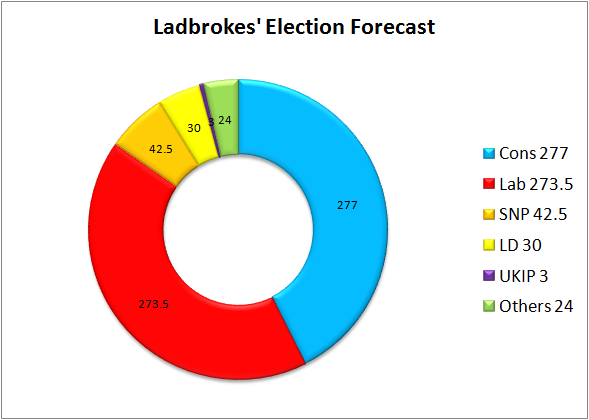 The Ladbrokes’ Election Forecast is produced by looking at our odds in each of the 650 constituencies and simply adding up which party is favourite in each seat. The half-seats occur in constituencies where we have joint favourites. A very small shift since two weeks ago, and one that doesn’t really change the post-election maths. It’s going to be very hard for David Cameron to remain as PM with a result like this.